Senate Republicans released a version of President Donald Trump's shutdown-ending proposal Monday, which, if passed, would fully fund the government and invest nearly $6 billion in building a southwestern border wall. The 1300 page "End the Shutdown and Secure the Border Act" (ESSBA) was introduced by Sen. Richard Shelby (R., Ala.) in his capacity as chairman of the Senate Appropriations Committee. Its contents mirror Trump's proposal to provide temporary amnesty for roughly one million illegally resident people, in exchange for funding for the president's long-desired border wall. Funding the wall—in one form or another—has been the fundamental source of contention in the nation's ongoing partial government shutdown. Now the longest in U.S. history, the shutdown has shuttered a number of federal agencies, as recalcitrant Democrats have refused to accede to Trump's demand for more border security spending. The proposal embodied in the new bill is Trump's "effort to compromise" with congressional Democrats, according to Vice President Mike Pence. 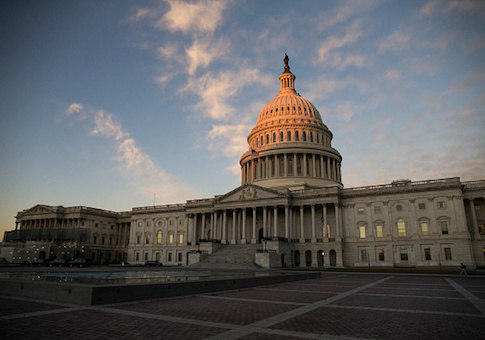 Prior to the shutdown, House Republicans passed a wall-funding proposal, but Senate Majority Leader Mitch McConnell (R., Ky.) concluded it was a no-go given the Senate's 60-vote threshold to end debate. The ESSBA appears intended as an opening volley in Senate negotiations to resolve the issue, as Sen. Shelby called on his Democratic colleagues to either back the bill or come to the table for a different solution. "The president has proposed a serious compromise to end this shutdown," Shelby said "It would not only fund the government and secure the border, but also provide immigration reforms the Democrats have long supported. For the good of the country, I encourage my Democratic colleagues to either join us in passing this legislation or come to the negotiating table with constructive solutions of their own. Saying no to everything will not move our country forward." In broad strokes, the bill would grant temporary protection to two populations of illegal immigrants: DREAMers and TPS-recipients. The former group—some 700,000 who arrived to the United States illegally under 18, and who were protected by President Barack Obama's DACA order—saw their protections expire last year. The ESSBA would grant them a three-year leave from deportation, including work permits and Social Security numbers. Recipients of Temporary Protected Status were granted protection from deportation when it was established that their home countries were too unsafe to return to due to natural disaster or conflict. Trump ended TPS for a large group of recipients last year; the ESSBA would reinstate it, also for a three-year period. In exchange for this temporary amnesty, the ESSBA would appropriate $5.7 billion for the construction of a "physical barrier" along the "highest priority locations" of the Mexican border. It would also provide funding for 750 new border patrol agents and 375 new customs officers, who would work to moderate the flow of drugs across the border. And the ESSBA would fund "custody enhancements, humanitarian needs, and counter-narcotics and counter-weapons technology," as recommended by the Office of Management and Budget. In addition, the ESSBA would attempt to curb the surge in unaccompanied children arriving from "northern triangle" countries by requiring them to apply for asylum at a processing center in Central America. "For the new procedure to achieve the desired humanitarian result," Sen. Shelby's release noted, "a further corresponding statutory change would be required to ensure the proper return of those who circumvent the process by coming to the United States without authorization." What this means practically is that children who claim asylum at the border or after entry—a common practice—will be denied and returned to their home country. This change alone may be enough for Senate Democrats to shoot the whole bill down, notwithstanding leadership's preexisting objections to any border barrier at all. If they do so, Republicans will be back to square one, leaving seven major components of the executive branch unfunded for the foreseeable future. This entry was posted in National Security and tagged Government Shutdown, Immigration, Senate. Bookmark the permalink.